You are here: Home / 2018 / Mindjammer Press at Dragonmeet 2018! 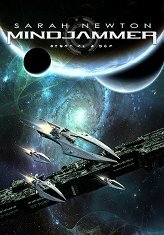 Mindjammer Press is going to have its own table at Dragonmeet in London this year. Come and visit us at table 51 in the Trade Hall at the Novotel London West, Hammersmith, London, from 10am to 7pm on Saturday 1st December! The Swallower of Souls, the quickstart for our up-coming cosmic fantasy RPG The Chronicles of Future Earth. hard-copies of the Monsters & Magic RPG. Mindjammer Fate Dice and Tokens Bag – 4 custom Fate dice and 25 custom Fate tokens, all in a monogrammed bag! Copies of the French-language Mindjammer screen, for completists, collectors, and fans of gorgeous screens! Perhaps even a few copies of the classic Chronicles of Future Earth supplement for Chaosium’s Basic Roleplaying! Stocks are limited, so come early to avoid disappointment! Also joining Sarah Newton and Jason Juta on the stand is François Cédelle, co-author of the original French version of Capharnaum – he’ll be signing copies of Capharnaum – The Tales of the Dragon-Marked throughout the day. See you there! The Commonality salutes you!